Windy with periods of rain. High 61F. Winds N at 20 to 30 mph. Chance of rain 80%..
A clear sky. Low 41F. Winds NW at 10 to 15 mph. As Americans, we’re blessed to live in a nation where investments and innovations in health care help millions of people every day to manage and overcome their illnesses. Yet the escalating prices of prescription drugs are a daily concern for every American in need of them. In fact, it’s one of the top concerns I hear from Iowans at my annual 99 county meetings as well as through phone calls and emails. For years, I’ve spoken out about skyrocketing prescription drug costs. As a fiscal conservative, I believe in strong intellectual property rights to incentivize companies to invest in research and development. I also believe wholeheartedly in free enterprise and the entrepreneurial spirit that drives innovation and opens new frontiers of modern medicine. However, the government has a responsibility to go after companies that engage in unfair business practices and anti-competitive behavior that harms consumers and cheats taxpayers. Congress must have a fundamental commitment to transparency. Sunshine helps to shine light on wrongdoing. It strengthens good government and bolsters the trust between elected representatives and their constituents. I’ve worked across the aisle to apply this standard throughout my time in the U.S. Senate, particularly in the area of health care. In 2016, Iowans contacted me regarding the increasing price of EpiPens. Families throughout Iowa and across the country need this life-saving anti-allergy medication but struggled to afford it after dramatic price hikes. That began a years-long look into the cause of these increases. During the course of my oversight efforts, I learned that EpiPen was misclassified in the Medicaid Drug Rebate Program as a generic drug rather than a name-brand medication. That misclassification may have resulted in taxpayers and states overpaying for EpiPen by as much as $1.3 billion over 10 years. What’s worse, EpiPen is not the only misclassified drug according to the U.S. Department of Health and Human Services and the HHS Office of Inspector General. The fiasco concerning EpiPen and the Medicaid Drug Rebate Program is just one of many examples where government oversight is critical to the protection of taxpayers and the safety of American citizens. My work in the Senate has focused on helping Iowans receive the quality health care they deserve. That has included oversight of elder care, increasing transparency between drug companies and the hospitals and health care providers that prescribe medications, as well as ensuring hospital payment programs are effective and working as Congress intended, such as those in the 340B program. As chairman of the Senate Finance Committee, I’ll continue these efforts and build upon the achievements of previous years in a bipartisan way. My top priorities include lowering health care costs — including prescription drug costs, increasing quality of care for seniors, addressing rural health care needs and conducting rigorous oversight of the Affordable Care Act, the health care nonprofit sector and executive federal health care agencies. Working together, we can build bipartisan solutions that will greatly improve our healthcare system. I’ll also continue to keep tabs on proposed buy-outs and mergers between pharmaceutical companies, insurance companies and health care providers to ensure that these transactions don’t weaken competition or negatively impact health care consumers and taxpayers. I’ll continue to fight for greater transparency by requiring companies to include drug prices in direct-to-consumer advertising. The more information patients and health care providers have to make decisions regarding prescription drugs, the better. These priorities are achievable through hard work and bipartisan cooperation. Last Congress, I worked to introduce legislation with every Democratic member of the Senate Finance Committee, and that spirit of bipartisanship will be a hallmark of my chairmanship this Congress. I welcome input not only from my Democratic colleagues in the Senate, but also the incoming Democratic House majority to join our efforts to improve health care on behalf of Iowans and every American. 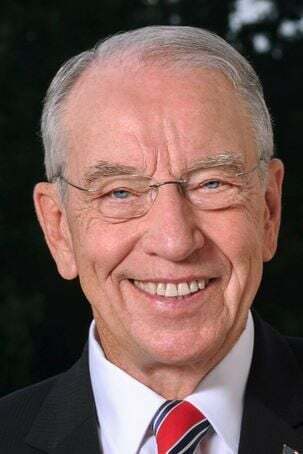 Charles Grassley is a U.S. Senator from New Hartford. Instead of trying to fix it, why don’t you just give us your health care plan? Looks like Chuckie G has did done changed his tune, folks. His TOP priority used to be Obamacare and the indervidueral mandate. Making America Great Again. He's a good farm boy Iowan. THINK!!! You need people to tell you to vote for him too, Mark David Chapman?